It was raining hard that day. We had kept our fingers crossed for snow so that the kids could have a white Christmas, but had 46 degrees instead. We had been waiting for my husband to come back home, bringing my mother with him. It was Christmas Eve, and now she was here, dressed in emerald green satin for the day. We were ready, the kids working hard to be patient, but the gifts under the tree had been staring at them the entire day and they were this close to losing their minds with wait. My mother came to find me in the kitchen and asked me in Spanish, so the kids wouldn't understand, "Did you get it? Did you find what they all wanted?" "I did, mama. And it's all wrapped under the tree." "Oh! Please tell me how much to give you, and let them have it last!" "I will. We can talk about the money later, Ok, mama?" I knew my children would be in my life forever, and I had that same amount of time to spoil them on my own. 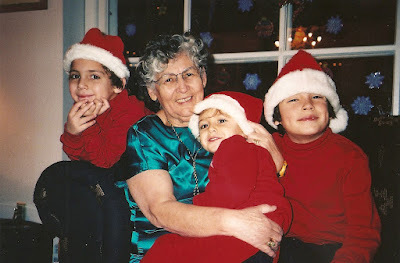 For my mother, my children were her second chance for the parenting she had dreamed of. She had been a young widow of 39 years old, left with six children, the youngest two months old. Working one full time job along with two part time jobs was her only way to feed us and keep us in a warm home. There was no time with us, my mother had no giving us of everything we wanted, not even a small amount of it. We were fortunate enough to have what we needed, but for the extras - like time alone with her, her presence at school events, the one gift that you wanted, those weren't part of our lives. What my husband and I had decided to give my mother in the last decade of her life, was to allow her forever with our children, whatever amount of time that worked out to be, to be one of giving them the gifts they had been pining for. That Christmas Eve night, in the moments of ripping open the paper when at last the gifts from Nona came out, it was as glorious as a mass at midnight. It was impossible for me or her, to make through without blinking away tears. It's us, my mother and I, who see the life we had before them, the one with them, the one they'll one day have without us. The scenes flash through from our hearts to our minds and we smile with tears brimming. Auggie had been asking for a castle that had been heavily advertised during his favorite shows. It was a hefty weight of one, one that came with all the essentials for a kingdom, a dragon who had red flashing eyes, moat doors that creaked outward and down, and knights that surrounded the turrets. Trumpets sounded when the king landed on the castle's front. When I pulled out the box with the castle from under the tree, and called out, "To Auggie from Nona," he ran to get it and dragged it over to my mother's lap. I watched them together take to the red and green holly paper. As soon as there was a peek at what was inside he went harder at the unwrapping, "It's the castle! Nona, you got me the castle!" I heard my mother's voice waver over the tearing of the paper, "It's so beautiful! You like it, m'ijo? Is it the one you wanted?" She called over to me in Spanish, "Did it cost, daughter?" Our eyes met over Auggie's head. My mother tried to speak, but her pressed lips wouldn't open. I rushed over to her and held her. She cried softly into my shoulder, "Gracias, hija, gracias." "It's Ok, mama, we love you." I didn't want her to worry about the cost of anything on that night. Auggie is 13 now, and the castle is still in my basement. I can't part with it, not in a rummage sale, not as a donation to another child. It is filled with what we had that night. The memory of my mother, with my son, and how it was just them together in that moment. That Christmas was the last one in that house. Our offer on a larger home had been accepted and we would be leaving our first home, the only one our children had known. My mother looked around at the end of the night and said, "I don't think you can find a warmer house than this one." I knew she meant the magic of the moments there. This is my wish for you this season. Moments that one day will warm you with memory. Thank you for reading my words, thank you for your encouragement with my work. Thank you for your time and love for me and my presence in your life. You are all part of the magic that I feel when I reflect on my life. Happy Christmas to you, my friends, and hopes of magic in this season and in the year to come. Oh, thank you. What a beautiful comment. Just sent you an email, Leigh Ann. Merry Christmas!